The Voice India finds its first winner: Team Shaan’s Pawandeep Rajan! 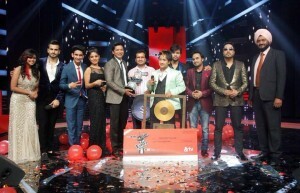 After a musical battle of 13 weeks, the popular singing reality show ‘The Voice India’ had its Grand Finale on Sunday 30th August. A star studded evening, team Shaan’s finalist Pawandeep Rajan was awarded the winning title and became the first winner of ‘The Voice India’. Team Sunidhi came fourth with her finalist Rishabh Chaturvedi, while team Mika came third with his finalist (and the only girl left in the competition) Parampara Thakur. The competition then became between team HR’s (multi talented Himesh Reshammiya) contestant Deepesh Rahi and team Shaan’s Pawandeep. Team HR came second in this musical battle of the voices! Pawandeep had been performing consistently well throughout the show and as well as singing, he also displayed his musical skills of being able to play the tabla and performing with an electric drums kit for the very first time on the grand finale night itself! Pawandeep has won a cheque for 50 lakhs rupees and a recording deal with Universal Music. Special guest singers Neeti Mohan, Ash King, Akriti Kakkar, Kanika Kapoor and Siddarth Mahadevan graced the grand finale along with comedian Kapil Sharma. Stay tuned for the full written update of ‘The Voice India’ Grand Finale on BollySpice this week! 17 queries in 1.041 seconds.